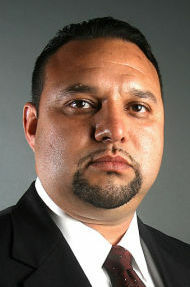 McALLEN — A former Rio Grande Valley police chief was remanded into custody after a federal judge found he had violated terms of his bond, court notes show. U.S. District Judge Randy Crane revoked former La Joya police chief Geovani Hernandez’s bond during a status conference hearing Tuesday for publishing posts on social media that violated the terms of his release. During the hearing, government prosecutors provided three sealed pieces of evidence to the court showing Hernandez had made the aforementioned posts regarding his current drug conspiracy case. The government entered three items into evidence without objection — “arguments presented regarding defendant’s social media posts,” the notes show. McAllen-based attorney David Acosta was appointed to represent Hernandez in May 2018, court records further show. Hernandez was arrested in early August 2017 in connection with a drug conspiracy case in which the government alleges he served as a go-between contact for an unidentified drug trafficking organization. In September of that year, the now 44-year-old Weslaco native pleaded not guilty to two charges of conspiracy to distribute a controlled substance and was subsequently granted a $100,000 bond. Government prosecutors allege that despite Hernandez’s long career in law enforcement, he was working with an unidentified drug trafficking organization, helping them facilitate the movement of illicit drugs. Special agents with Homeland Security Investigations in McAllen received word in August 2016 that Hernandez was helping move drugs as a member of an unidentified drug trafficking organization, the complaint states. During the meeting Hernandez allegedly told the informant that he needed money for his campaign bid for a Hidalgo County constable post. He also told the informant that he was a close friend of Gulf Cartel Plaza boss Juan Manuel Loza-Salinas, aka “El Toro,” who ran a plaza in Reynosa, Mexico, the complaint states. “(The confidential informant) told Hernandez that his organization was sending vehicles north and that they needed to run record checks on vehicles. Hernandez told the government informant to find him the vehicles’ identifiers and that he would get him the information they needed in exchange for $1,000,” the complaint states. Hernandez met with the informant days later and handed the person a document that contained detailed information regarding the vehicle license plate. On Nov. 9, 2017, the court granted Hernandez his release on bond after he and his wife put up 5.7 acres of real estate in lieu of a cash deposit of $100,000, court notes show. Hernandez, as part of his supervised release, was expected to be relegated to his home, required to wear a GPS monitoring device, and not be allowed to leave his residence for anything other than meetings with his lawyer, court proceedings, medical care and employment reasons. He was also ordered to surrender his concealed handgun license, court notes read. Jury selection is set for Feb. 19, with his trial set to begin March 4, records show.